While tax deadline was graciously postponed from April 15 to April 17, this year, it was LDOY (Last Day of Year) Sunday at many Utah ski resorts, including Deer Valley and Park City Mountain Resort. With a couple of inches of fresh on the slopes, it was a suitable sendoff! 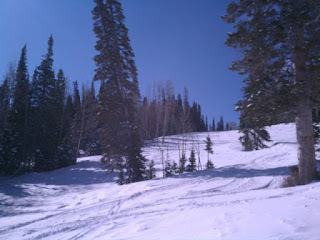 Last day of 2011-12 ski season! ﻿ A number of closed and pending sales in Deer Valley have underscored the rebound of the higher end of our market, even as the resort closes for the season! New pending sales in the last 30 days at St. Regis, 3 Deer Crest homes, Bellemont, Solamere and The Belles (at Empire Pass) provide a number of solid upcoming closings in the market. With 2 recent closed sales in the Bald Eagle community, the indication is that the smarter, fatter wallets are choosing to park a few bucks in Deer Valley, as prices remain soft and inventory shrinks. Notable closed sales in lower Deer Valley, at 3763 Fox Tail Trail and at 3626 Oakwood Drive recorded at the end of March at 2m and 2.6m respectively. Recent closed condo/townhome sales at Ridgepoint, Blackbear Lodge, Sterlingwood, Shooting Star, Larkspur, and two at Lookout have doubled the first quarter sales volume of "Upper Deer Valley" condos over that of first quarter 2011! ** A two bedroom condo at the luxurious Silver Baron Lodge in lower DV represents a great buy in the mid $500k range, producing 45-50k gross rental revenue in 2011. ** A Black Bear Lodge 2 bedroom "short sale" at $465k represents a great buy in upper Deer Valley! ** A two bedroom Chateaux at Silver Lake Luxurious, classy, almost ski in/out and nearly 100k below the next best priced at Chateaux! ** 102 Flagstaff at Empire Pass Last one left in this high end, high quality ski in out building! For the latest information and further facts and opinions... Call, e or text Al Johnson at Sothebys in Deer Valley!